Our fabulous new website launched in March. Thank you again Net Tango for your great work! We have had amazing feedback on our new look. The site is mobile responsive so it works beautifully, and appropriately on any device you use. Joe's House website is visited by over 125,000 users per year. There are over 340 hospitality houses listed on Joe's House website. 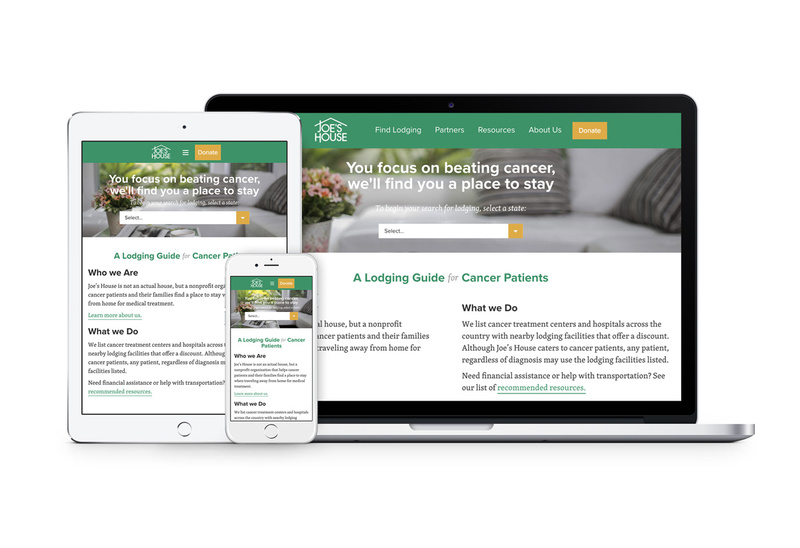 These include the American Cancer Society's Hope Lodges, Ronald McDonald Houses and all of the members of the Healthcare Hospitality Network. You can search for lodging in 48 out of 50 states plus the District of Columbia. There are lots of ways to give without making a direct donation. Choose Joe's House as your charity when shopping at Smile.Amazon.com or Ebay! Goodshop is another organization that donates part of your purchase price to charity. Condolences - Our deepest sympathy to the family of Craig Bade. Craig was an exceptionally funny guy and a great supporter of Joe's House. He was treated at MD Anderson Cancer Center in Houston.